The Kettler EX3 upright exercise bike has a smooth silent electromagnet brake, a large 22-lb flywheel, and an easy mount step-through frame. 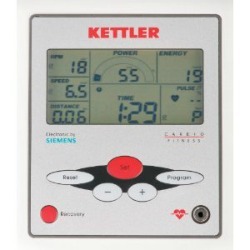 On the console, the Siemens electronic LCD high resolution display shows feedback including speed, RPMs, time, distance, energy consumption, performance in watts, and pulse rate. The Kettler EX3 upright exercise bike features the company’s patented Inducktions Braking System with a range of 25 watts to 400 watts of electromagnetic resistance. 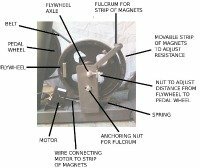 The rest of the drive system consists of a hefty 22-lb flywheel, a quiet Poly V drive belt, and sealed ball bearings – all combining to provide a smooth and maintenance-free exercise bike, backed by a 3-year warranty. The high carbon steel frame comes with a lifetime warranty. The padded seat can be positioned fore/aft and up/down and the handlebars can be adjusted to almost any angle for the best fit for each user in the household. The pedals are weighted and fitted with toe straps, and the Q-factor (spacing between pedals) is a comfortable 7.5 inches. Two of the four pre-set training programs are Heart Rate Control (HRC) workouts that automatically adjust the resistance levels lighter or harder depending on your heart rate reading. The bike comes with an infrared earlobe clip sensor for heart rate monitoring; another option is to add a Polar wireless chest strap transmitter (not included). 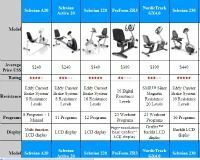 At $699, the Kettler EX3 Upright exercise bike offers 75 resistance levels and a reliable ergometer to provide precise performance data. It gives the user a comfortable upright posture and a good-size 22-lb flywheel for a superior exercise session. Users indicate these are quiet and comfortable bikes, though typically you won’t find many reviews on it. 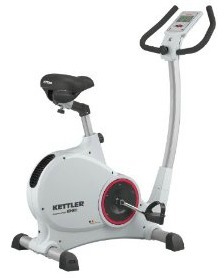 This is a good indoor cycle with a solid warranty offered by KettlerUSA, the US distributor of this German brand.